One of the hottest styles to hit the street this season. Our wrap skirt is available in different color combinations and features an elastic, drawcord waist for comfortable wear and easy adjusting. They can be used by all the age groups and for all occasions. 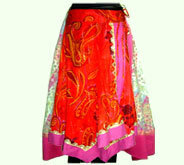 To satisfy our clients with value added services, we design and manufacture skirts as per their specifications. 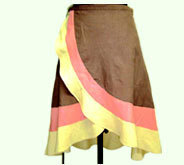 Desc : Brown colored wrap skirts having yellow & pink border are sure to enliven the mood of wearers as well as viewers with their fascinating look. 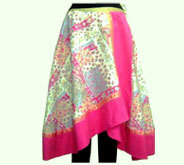 Desc : Artistically designed with multicolor patterns and pink edge, this wrap around skirt along with matching blouse, top or shirt endows a fabulous beauty to the women. Desc : Reflecting the deep understanding of the colors, our ingenious artisans have trimmed these cotton wrap skirts with lovely patterns of a plethora of enrapturing colors.